We all know that albino animals have pink eyes and skin. So why is this albino lab rat blue? According to new research, the same blue food dye found in M&Ms, Jell-O and Gatorade could be used to reduce damage caused by spinal cord injuries. 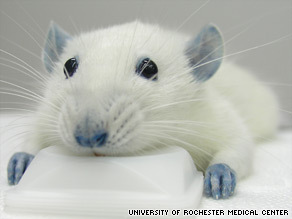 Researchers at the University of Rochester Medical Center found that when they injected the compound Brilliant Blue G (BBG) into rats suffering from spinal cord injuries, the rodents were able to walk again, although with a limp, CNN reports.